TriBella from Venus Versa™ combines the power of three unique non-surgical procedures into one complete skin renewal treatment — resulting in incredibly smoother, younger, healthier-looking skin. This high-intensity non-invasive solution gives highly visible results faster and in fewer treatments. It was awarded “New Treatment of the Year” at the 2018 My Face My Body Awards. Featuring intense pulsed light (IPL) with SmartPulse™ technology, the SR515 and SR580 photorejuvenation applicators deliver precise bursts of intense pulse light to improve the appearance of uneven skin tones and sun damage. The real-time cooling feature built into the laser, ensures consistent results and patient comfort. The anti-aging treatment utilizes (MP)2 technology—a synergistic fusion of Multi-Polar Radio Frequency (RF) and Pulsed Electro Magnetic Fields (PEMF) to increase blood flow and enhance natural collagen and elastin production to smoothen fine lines, improve skin laxity, and fade the appearance of wrinkles. 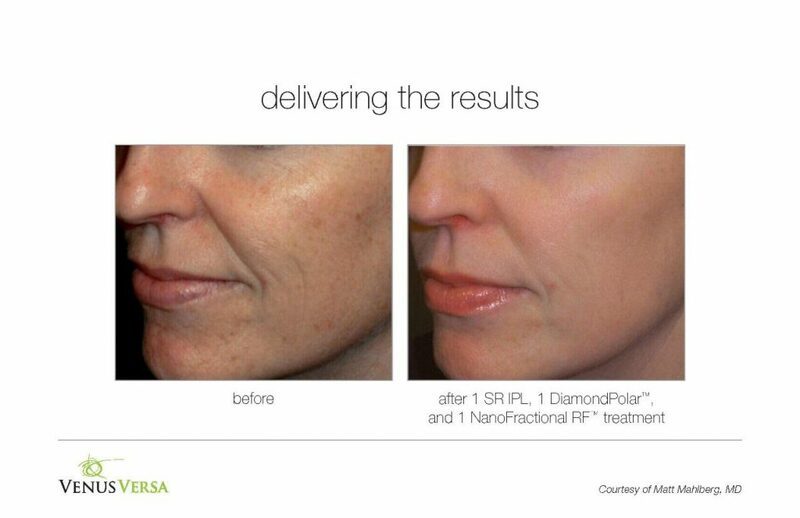 The final treatment in the TriBellaTM procedure, the skin resurfacing treatment harnesses the power of NanoFractional RFTM and patented tip technology to improve the appearance of textural skin conditions, such as acne scarring, rosacea, uneven skin texture, enlarged pores, dyschromia, and pigmentation. This procedure delivers energy deep into the skin utilizing tiny electrode pins to crease “micro-dermal wounds.” As the skin heals, it naturally boosts collagen and elastin production which promotes overall skin renewal and rejuvenation. The ideal candidate is someone with signs of skin aging and damage, such as lines, wrinkles, uneven complexion, or uneven texture. 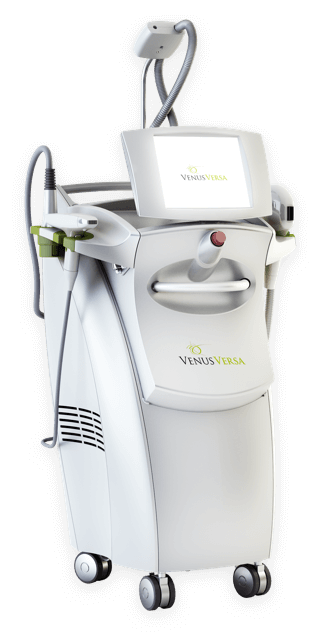 Venus VersaTM TriBellaTM treatments work to improve skin tone, elasticity, and texture. Contraindications include excessively tanned skin, a history of skin disorders, implants in the treatment area, or an active condition that may be stimulated by light or heat. Each TriBellaTM treatment session takes approximately 90 minutes to complete using three applicators with 10 minutes of delay between individual treatments. This includes numbing time at the beginning of the procedure. Three TriBella™ treatments are recommended for optimal results (in most patients). While some results will be visible after the treatment series is complete, best results occur approximately three months after the last treatment session. How long the results last, however, will depend on how the patient’s skin reacts to the treatment and after-treatment care. For example, if the patient properly protects skin from the sun, the results will last longer. To maintain best results, treatment providers will discuss customized maintenance programs with each patient and a touch-up session every six months is generally recommended. Skin will be sensitive to sunlight and visibly red or flushed following treatment. No makeup or skin care products, aside from Dr. Chahin’s recommendations, should be applied to the treatment area for a few days following treatment, at which time sun protection should also be applied regularly. Our office carries all your post-procedure skin care essentials and we can show you which ones would be recommended for you. 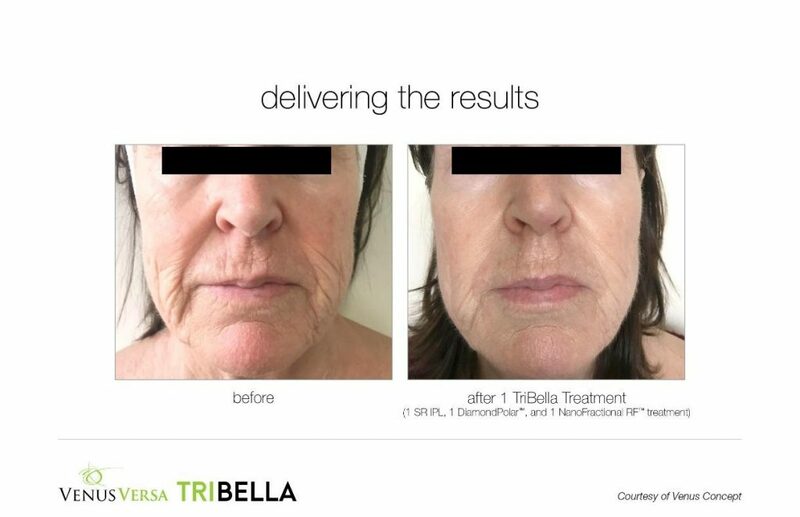 It is important to note that TriBella™ consists of three treatments—photofacial, anti-aging, and skin resurfacing. Photofacials are powered by IPL technology, which targets pigment in the skin. They tend to work best for light to medium skin tones because the heightened stimulation poses a greater risk of discoloration to patients with more pigment in their skin. While those with darker skin types may be candidates for the treatments separately, all treatments performed together in one session may not be the best fit for them. Treatment providers will perform a test spot and/or make individual recommendations for each candidate with skin type and safety in mind. How often/ far apart should the treatments be? Best results are obtained with a treatment protocol of three TriBella™ treatments at a frequency of one treatment every four to five weeks. Three to five days of social downtime primarily if any following treatment may be expected where the skin may be red or flushed. The patient may return to normal activites the following day which includes working out. We recommend wearing a hat for any sun exposure reduction immediately following the treatment. Optimal results should be visible approximately three months after the third treatment.